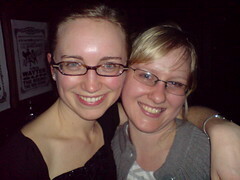 Had a fun night out last night with my cousin Jessie and her Cambridge-studying friend Megan. Met up at the Tate Modern, walked the Millenium Bridge, past "feed the birds square" in front of St Paul's, through Smithfield Market, dinner at [St John](http://www.stjohnrestaurant.co.uk/), on to Upper St for cocktails at GU and a final beer at [The Hope & Anchor](http://en.wikipedia.org/wiki/Hope_and_Anchor,_Islington), accompanied by the last few songs of a set by [Big Num](http://profile.myspace.com/index.cfm?fuseaction=user.viewprofile&friendID=23149511). Great way to celebrate being back in London!